NOTE: This section changes frequently. Please ask and check back often. We have just about everything under the sun.  Continental Soft Paste Porcelain: Large Handpainted Victorian Fantasy  Girl Riding Luster Seashell Planter Pulled by Unicorns. Exquisite! 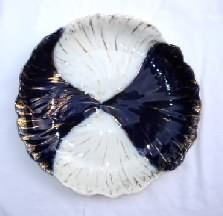  American Pottery: Abingdon, McCoy and more.  Royal York Replacements: gravy, cups and saucers, more.  Bates Chenille Bedspreads. Double size, Key Lime. Single size, beige with navy blue eagle motif.  1930 felt red Christmas stocking, nursery rhyme, cheeky Mary had a Little Lamb. 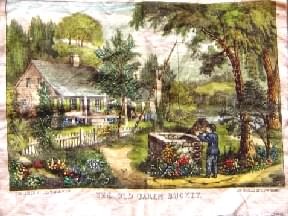 Currier and Ives handpainted colorful vintage decorative linen titled, The Old Oaken Bucket. Image size 9 1/4 x 6 1/4.